My body is a sea cave. With every crashing wave, every weebly-wobbly tilt of our ship, every rollercoaster-like moment of catching air before slamming down with an audible thump, it feels as if the cavern of my belly is filling with sloshing water, gradually rushing higher and higher in search of any crevice through which it might escape. With great effort, I manage to hold nausea at bay… but just barely. We’re aboard a 20-passenger yacht on a weeklong adventure through the Galapagos Islands. On our first night, we’re sailing north from San Cristobal to the island of Genovesa. And, although I’ve always loved the ocean, I’m coming to the realization that I’m not much of a seaman. It’s best out on the sundeck, where lounge chairs offer exceptional views of the sun setting on Kicker Rock, plus a refreshing wind that turns to a brisk chill as the evening sky provides the most brilliant star show you can imagine. For all the tranquil serenity of its natural beauty, this archipelago of islands located 600 miles off the coast of Ecuador has a remarkably rough ‘n’ tumble history. Mankind has been trying to tame these islands for centuries– long before Charles Darwin concocted his Theory of Evolution based on the groundbreaking scientific discoveries he made after the famed voyage of the Beagle. The islands were discovered by accident in 1525, when Spanish Bishop Tomás de Berlanga’s ship drifted ashore, its crew on the verge of death from lack of water. 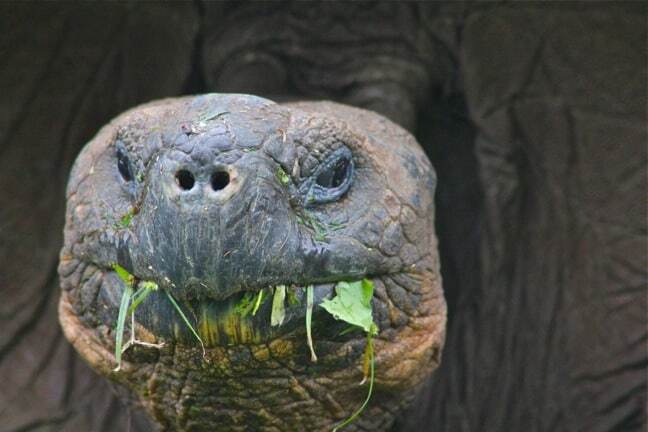 During the 17th and 18th centuries the Galapagos was a favorite spot among pirates (who hid there after attacking Spanish galleons, pillaging the local tortoise population for meat) and whalers (who plundered its waters for their ample bounty). Yet all efforts to colonize the area ended in death and despair, and by the late 1800s the islands were considered cursed. 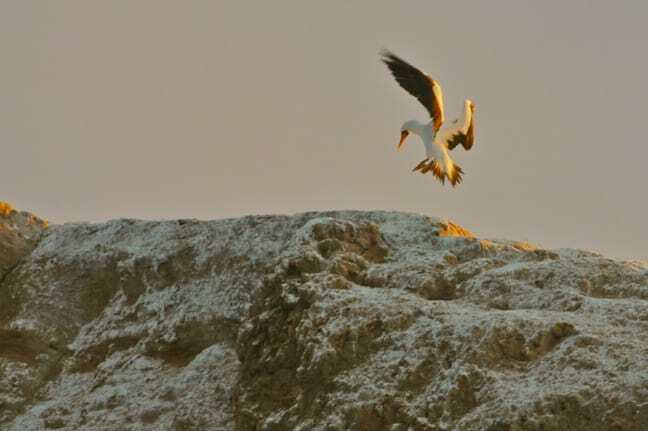 Even now, most of the islands remain uninhabited, and laws put in place to protect the remarkable biodiversity of its ecosystems are designed to keep it that way. 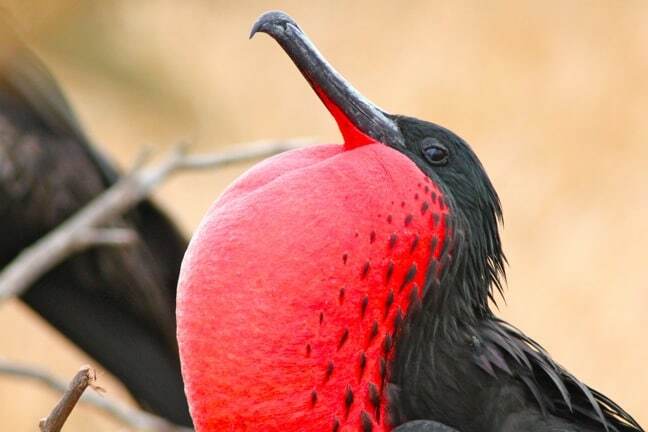 In fact, 97.5% of the Galapagos archipelago is one big national park, meaning you couldn’t move there if you wanted to. From the moment we set foot on Genovesa, I immediately understood why the Galapagos National Park works so hard to preserve the region’s delicate ecological balance: It was like nothing we’d seen on our previous adventures abroad. We walked perhaps 100 yards in a span of 3 hours, never deviating from a narrow, clearly marked path, and yet we were met by an Eden-like abundance of wildlife. 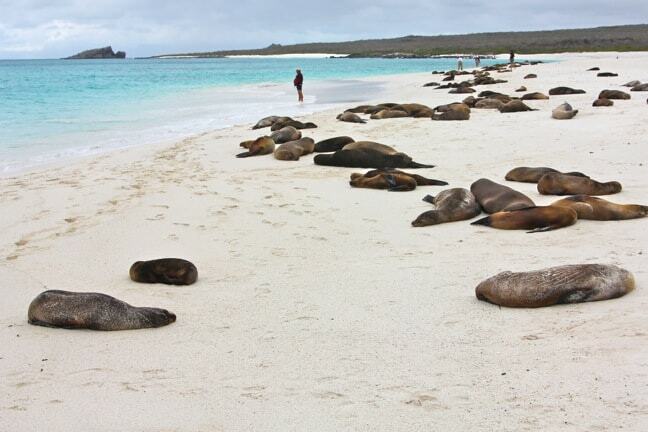 In the Galapagos Islands animals are everywhere: The beautiful beach was lined with sea lions sunning themselves, seemingly oblivious to our presence. 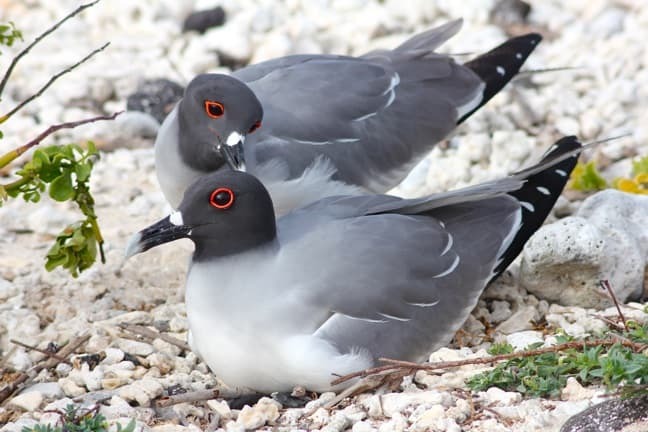 A mating pair of red-eyed swallow-tailed gulls nested on the open beach, while another female tended to her baby on the rocks nearby. Tiger herons, Nazca boobys and red-footed boobys were literally everywhere, the babies eagerly squawking for their next meal from nests near or even on the ground. Because they have no natural predators and have not yet learned to fear humans, most of them were close enough that we could have easily touched them (though no one dared, for fear of the wrath of our passionate naturalist guides). Though we loved Genovesa for its picturesque scenery and diverse wildlife, every island we visited offered distinctive pleasures. We spent an amazing morning off the coast of Fernandina– the youngest island in the archipelago– spotting Bryde’s Whales spouting, then went ashore to find hundreds of marine iguanas cluttered en masse like kittens (albeit hissing, spitting kittens who look like mini-Godzillas). It was also on Fernandina that we witnessed a mesmerizing mating ritual among flightless cormorants, of which there are less than 1,000 left in the world. The bizarre volcanic rock formations of Santiago Island were home to thousands of colorful Sally Lightfoot crabs, which darted and dashed amongst the rocks along the shore as young sea lions frolicked playfully in the surf. The massive eroded tuff cone of Pinnacle Rock made Bartolome Island a perfect spot for catching a sunset, while hiking up the otherworldly landscape to the volcano’s summit offered an excellent workout the next morning, providing spectacular views that stretched on for miles. 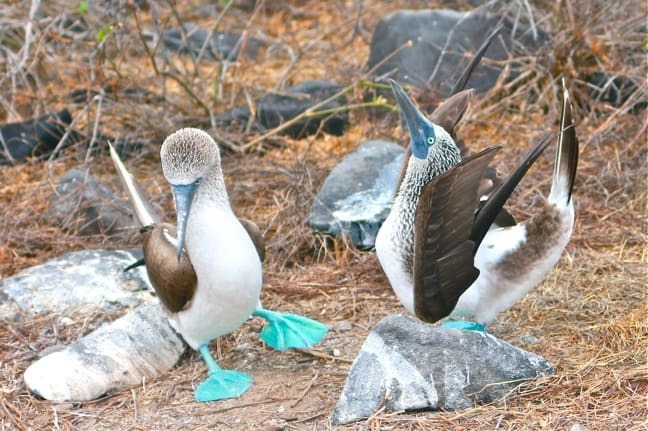 North Seymour Island featured the dazzling colors of blue-footed boobys, brilliant yellows and oranges of land iguanas, and vivid red inflated pouches of magnificent frigate birds hoping to impress potential mates. On the island of Santa Cruz we explored the Charles Darwin Research Station, the heart of Galapagos conservation efforts, where we learned about prehistoric-looking Galapagos Tortoises and how selective breeding brought them back from the brink of extinction. We learned how invasive species and over-hunting nearly wiped them out before the Galapagos was declared a national park in 1959 (100 years after the publication of Darwin’s The Origin of Species), a UNESCO World Heritage Site in 1978, and a 27,000 square mile marine reserve in 1986. Today, with a population of over 19,000, the tortoises’ future, and that of other amazing animals in the Galapagos, seems secure thanks to strictly-enforced conservation laws. If there was one surprise about our Galapagos adventure, it was how undersold the islands’ underwater attractions are. We’ve snorkeled all over the world, and never have we seen the sheer diversity of species with which we were met every single time we entered Galapagos waters. Few words can express how weird and wonderful it is see a bird (the flightless cormorant) swimming on the bottom of the ocean beneath you, or to watch a marine iguana feeding on algae 20 feet beneath the surface, or to accidentally follow a trio of Galapagos sea turtles into a school of medusa jellyfish that look like something straight out of Finding Nemo. This is the only place in the world where you can find yourself swimming with penguins, marveling at their rocket-like speed as they zip through the waves. White-tipped reef shark spottings are frequent, though they were the one Galapagos species that seemed to avoid humans like the plague (perhaps due to the increasing frequency of illegal shark-finning in the area). But my favorite memory was swimming with Galapagos sea lions, which seemed ambivalent on land but in the water proved eminently curious and eager to engage. 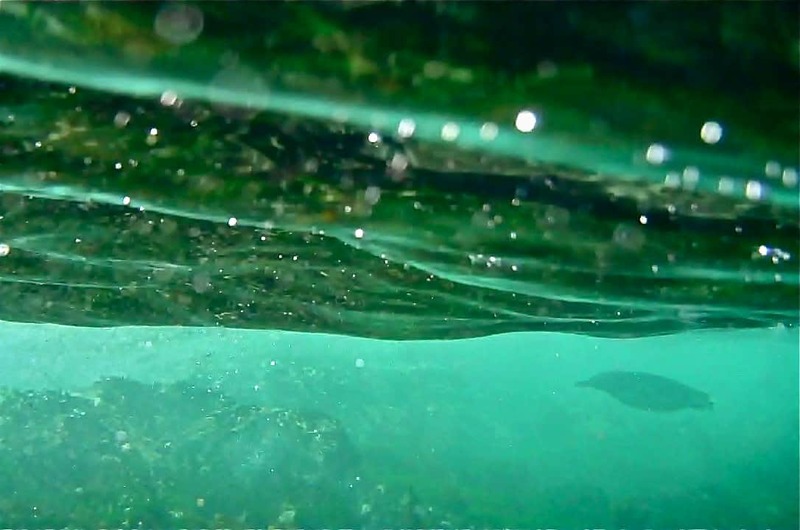 Our most memorable encounter came off the island of Santiago, where I swam alongside a young sea lion with my video camera as he floated lazily. As I twisted and turned to get the best shot of him, he began swimming faster and faster, coming closer with each subsequent pass. The more I contorted my body to keep him in frame, the more playful he got, zooming beneath me like a torpedo, blowing bubbles and flipping out of the water. I dove down and tried to mimic him, only to realize he was mimicking me. It was one of the most exciting and exhilarating experiences of my life. The truth is, EVERYTHING in the Galapagos seems so spectacular that you can have a once-in-a-lifetime experience and not even realize it. Snorkeling on our first day off the coast of Playa Ochoa, I filmed a small, iridescent blue fish that glowed like neon in the waters 75 yards from shore. I thought nothing of it until the end of our journey, when our group was watching my video clips on the Eric’s flat-screen TV. Neither of our guides had ever seen anything like the fish, nor had the Captain. So when we visited the Charles Darwin Research Station, Ceci took me behind the scenes to speak to the scientists. 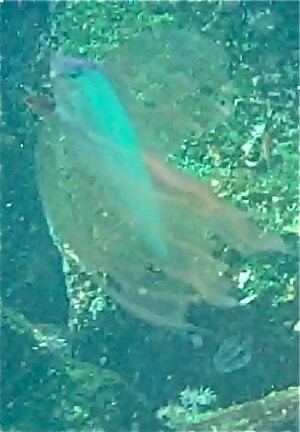 Our Galapagos Islands Mystery Fish, a.k.a the Lovefish. It remains entirely possible that we have the only documented evidence of what may prove to be a new fish species. 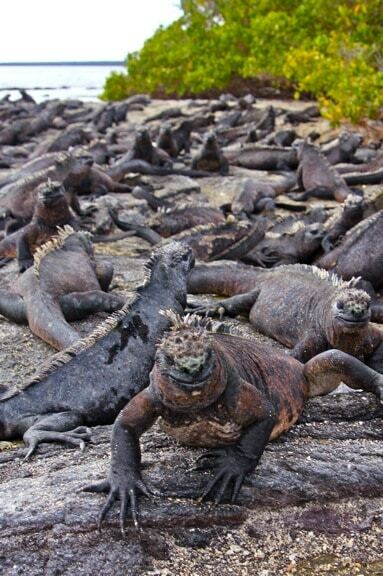 The Galapagos Islands may not be for everyone. The physical challenges of two hikes and a snorkel per day require a hearty constitution, just as the waves of inter-island passages require a strong stomach.